Back in 1983, Steve Jobs spoke at International Design Conference (IDCA) in Aspen, a 20-minute audio recording of which was available from the Center for Design Innovation’s website. Now, the full 1-hour audio recording of Steve’s amazing speech discussing things like wireless networking, App Store and the iPad has surfaced, thanks to folks at LifeLibertyTech.com who got their hands on one of the cassette recordings from the conference which were handed out to all attendees (via 9to5Mac). During the conference’s Q&A session, he was asked about voice recognition to which he replied, “This stuff is hard.” He noted it is likely close to a decade away from reality. He also talked about wanting to get a computer like Lisa, which cost close to $10,000 at the time, into a book design for under $1,000 within 5 years to 7 years. Other discussions include home networking, which Jobs correctly predicts was about 10 years away, his vision of future pocket-size computers, typefaces and graphic design. 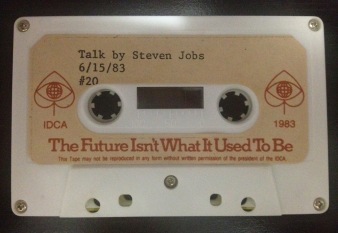 Below is a digitized recording of a “Talk by Steven Jobs” from the 1983 IDCA.